← Order by this Tuesday: Poetry on the move! 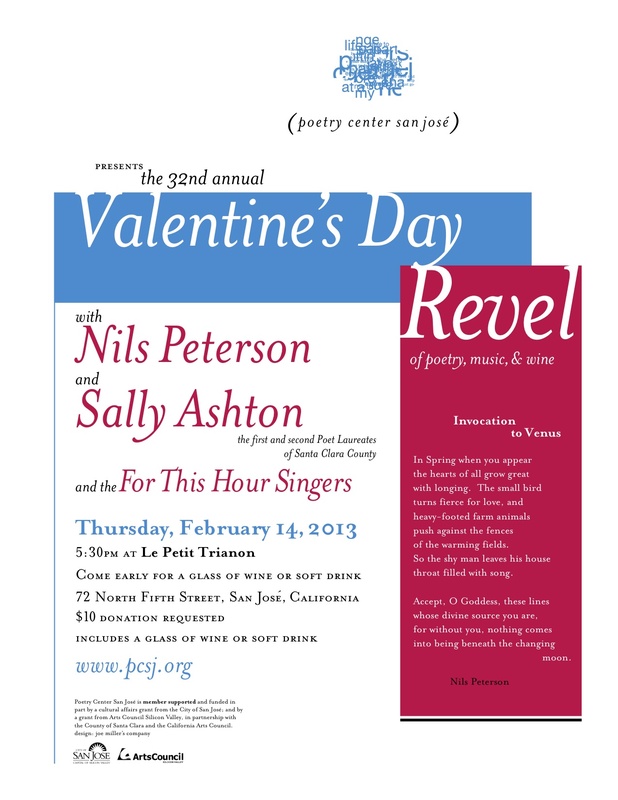 It is that time of year again, time for Nils Peterson’s 32nd annual Valentine’s Day Revel sponsored by Poetry Center San Jose. I”ll be joining him again as I have for the past 5 years, as will the “For This Hour Singers” who will sing madrigals, plus a special appearance of the “Nils Brothers Quartet,” as well the usual Nils&Sally banter. How could you miss it? Let me say this: we schedule the event early so that those with other plans can still make their date. We make a nice launching pad. We also love to celebrate notions of love and hysteria with those who are single. I view the revel as a Valentine’s Day Antidote, but hey, maybe that’s just me. So there’ll be something for everyone including that part-of-the-donation glass of wine. We’re just trying to pay the rent and have some fun doing so. How wonderful that Le Petit Trianon has survived another year. We have too! So have you! Let’s Celebrate~Hope to see you there.